Having climbed and walked in most parts of the globe in my opinion (John Cuthbertson) your boot is the most important item of equipment in the hills as your being able to use a rope, axe or crampons effectively. This is based on 55 years of being in the hills (horrifying I know!) …with no blisters in all sorts of environment and weather. John has owned and run Snowgoose Mountain Centre since 1990, takes a good look at various features of a good winter mountain boot. These are just few pointers based on his own experience and what he looks for when choosing a new boot for himself or giving advice to clients on a summer or winter mountain course with Snowgoose Mountain Centre. Note: The notes below are not intended to recommend any make or type of boot – these are just words of wisdom. The choice is yours! Warning: For any walking trip a B3 boot is not overkill! A B1 boot may be adequate for a summer trek in the UK but is not sufficient for the rigors on Scottish winter mountains, or for following easy paths in winter but a B2 / B3 boots will give much better support. Warning: The weather and snow conditions on Scotland’s winter mountains can be – and usually are – very varied from day to day – or even from hour to hour! Weather, snow, hail and ice combined with the variety of situations you might come across mean that you don’t want to be limiting your options before you’ve even set out on your planned mountain trip. 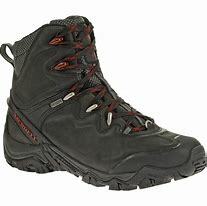 Therefor it is logically important to choose the correct walking or mountain boot for what you want to do. Crampon compatibility is by no means the only criteria on which to determine whether a mountain boot is suitable for a Britain’s winter mountains. So, what is this “shank nonsense about! In a boot or shoe, the shank provides rigidity along & across the sole of the boot when crossing scree or boulder fields. A shank is crucial to the functionality of mountaineering boots as they diminish the load incurred by the wearer’s feet and calves over the course of an ascent. The shank is actually a metal stiffener in the sole of a boot both across the width and length of the boot. This can be minimal as in a B1, half shank in a B2 or full shank as in a B3 boot. There are also options of nylon and fibre glass shanks. B1, B2 or B3 boots? B1 boots are usually only worn as summer trekking boots – often known as “bendy boots”. They do not have a stiff sole and have some flex in the sole, not suitable for use with a C1-rated strap-on crampon. Not recommended for any Scottish winter mountain work. OK For: flat, easy trails in the summer months or general, everyday use. Not Recommended For: Multi day hikes or walks carrying anything heavier than a daypack. Nor for rugged terrain where ankle and foot protection are important. Generally not be waterproof so are not suitable for wet and cold weather. The sole is also not stiff enough to be used with crampons. B2 boots generally have a half shank and take both C1 crampons and C2s with a step-in binding at the heel but not at the toe. More rigidity in the sole means slightly less comfortable walking, but better performance on mountaineering ground. Good all-rounders for both walking and climbing in the lower grades. OK For: summer/spring walking where the terrain is fairly firm and low level and not particularly steep. Most are waterproof so they are well suited to British Summer which may be drizzly. B3 are pretty much fully rigid and compatible with all types of crampon including rigid C3s with a full step-in binding at heel and toe. Designed specifically for mountain climbing in mind. As far as I am concerned there is only one type of boot I would recommend to wear in winter in Scotland. This is a fully shanked boot for a number reasons. Suitable for year round use in the UK, including on rocky terrains and steeper paths. Almost always waterproof so very versatile. Can be used up to the snowline and, in some cases, for short periods of time with a flexible crampon when crossing a snowfield (always check with the manufacturer if your boots are crampon compatible). Not suited for use above the snow line when extended crampon use is necessary and very extreme conditions, where it will be very cold, wet or icy, for example scaling Everest or glacier walks. Boots at the higher end of the 3 season category could need a fair amount of breaking in and if only used on very easy, low level walks could be tiring. Most recently mountain boots have been made of synthetic fabrics, leather or plastic. But things do seem to be changing with technology and designs improving every year. Plastic is still a good choice for winter in the Alps and for High Altitude work. However, today’s improvements in the materials used for soles, uppers and improved construction mean leather boots are now both rigid, light and warm for winter climbing and operating at height. 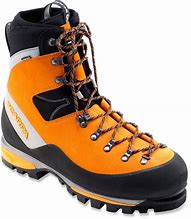 The latest ideas of combining the modern leather boot for technical climbing means that winter mountaineers in Scotland can get the comfort, warmth, lightweight, durability, and stability required for snow and ice work and yet have the precision and fit required for high level ice / rock moves. With so many different boots available due to the many different types of mountaineering being undertaken throughout the world, it is important to choose the boot that it right for what you want to do. The right tools for the right job! Just keep in mind on most UK winter walking days a lot of time is spent below the snow line, so just as important as crampon fit is general all-terrain boot comfort……… mile after mile. The outsole is the strip of rubber along the bottom of the boot which features the tread. The tread patterns will vary depending on type of terrain the boot will be used on, the manufacturer but all serve the purpose of grip with chunkier patterns are better in mud, while shallow tread is better suited for a rockier path. The most popular and best known brand is ‘Vibram’ which has a long standing sign of quality and are made of rubber or thermoplastic rubber (TPR)but that isn’t to say standard soles won’t be suited to your activity. “Vibram Soles” are made from a mix of rubber, carbon and silicone and are stiffer and denser than other types of rubber. Vibram soled boots are renowned for providing exceptional grip thanks to the tread patterns designed for enhanced performance. The midsole as the name suggests, fits between the insole and the outsole. The job of a midsole is to act as a shock absorber, helping to cushion and protect your feet as you walk. This is a layer of material between the inner soles and outsoles. It provides support and is important for shock absorption and, along with the outsole, protects the wearer from sharp objects under foot. The purpose of heel and toe bumpers is to protect your toes and heels from knocks, which is particularly important on rocky terrains. Heel and toe bumpers also protect the boot from damage so they last longer. It is ideal if most of the foot (the uppers) has a minimal amount of stitching and is designed in a single piece to cut down the amount of stitching. Wear and tear exposes stitching which is a potential source of leaks from damage from rocks. Keeping stitching high on the foot means that it is out of more likely to be out of contact with water and harm’s way. It is best if ankles are supported by a high cuff which is padded with a sculpted rim. A little bit of stretch is good for some freedom of movement. Weak ankles can really appreciate protection on rough ground especially in winter when the ankle needs to roll to engage all the crampon points on hard snow slopes. The tongue should be comfortable & soft, with stitching high enough to keep the boost from being flooded when standing in water or splashing through the inevitable bogs, mud, water and wet snow. With the right amount of external protection given by a good boot outside lining is almost un-necessary but make sure one is there. While we’re still inside it’s worth mentioning the Memory Foam at the heel, which molds to the foot shape to offer a customised fit and reduce heel lift; it works for me, and I’ve had no issues with rubbing at the back.